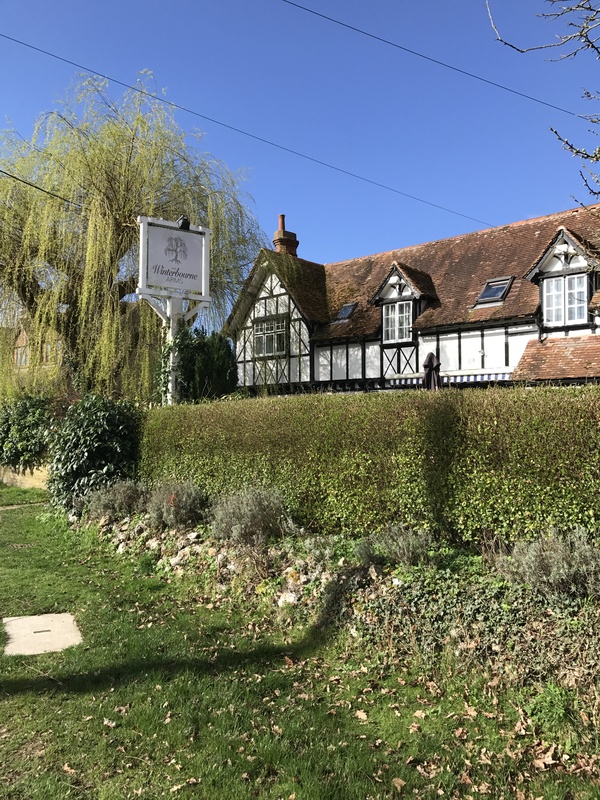 I live in West Berkshire some of the time and the six (mainly) gastro pubs listed here are my favourites for a combination of good food and great atmosphere and for some rural charm so that they feel different to the places I would visit in London. They are all between junctions 13 and 14 on the M4 so quite near Reading and only an hour from London. This isn’t a comment on the many pubs I haven’t mentioned – but simply a list of my personal favourites. I have also written a related (and in depth) post on 10 things to do in West Berkshire which will go on this site some time this week. The Queens Arms in East Garston is a 10 minute drive from the Pheasant and like the Pheasant caters to the racing set showing the Cheltenham cup on TV all week, as well as the locals. The bar area is old fashioned and lively while the restaurant is more gastro pub and the food is always good. I often come for Sunday lunch. 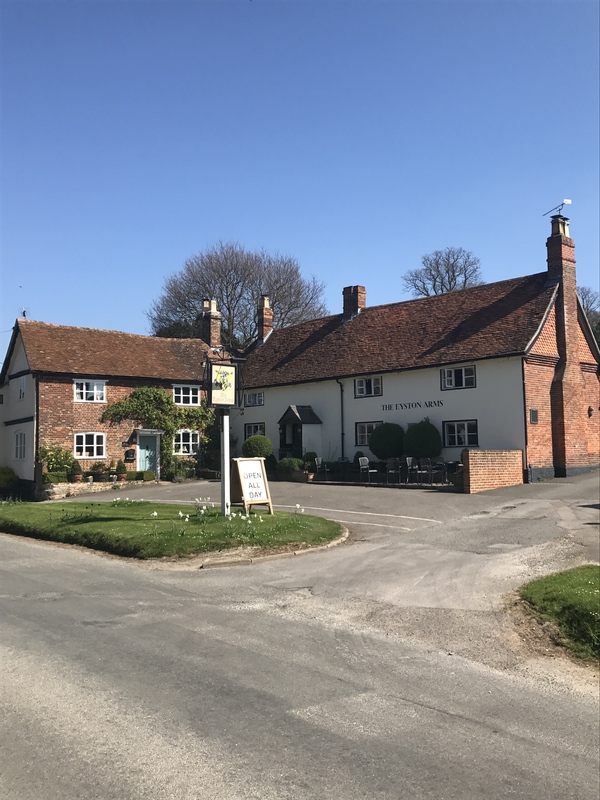 The pub is on the main road but after lunch make sure to turn off he main road into the pretty village of East Garston and also to visit the next village Eastleigh both covered in my post on 10 reasons to visit West Berkshire. In former lives it was called the Blue Boar and at another time, the Crab so the new pub owners asked us all to vote for its new name and The Crab and Boar was the winning name. It is more gastro pub than pub these days. The food is very good. The setting is lovely and the experience always a great though they’ve done away with the white tablecloths which, when on the outside tables in Summer under previous ownership made this look and feel like a wonderfully special restaurant in France. The pub has one of the two original china blue boars from Charles I time – rumour is he stayed here. It specialises in fish but also does great Sunday roasts and usually has game on the menu too. The Crab and Boar is a ten minute drive from junction 13 on the M4 motorway from London. If you visit it, take in the pretty village of Brightwalton (and its wonderful farm shop Saddlebacks) or drive out over country roads to the market town of Wantage (supposedly home of King Alfred of burnt cakes fame) or go beyond it to the pretty Oxfordshire village of East Hendred. 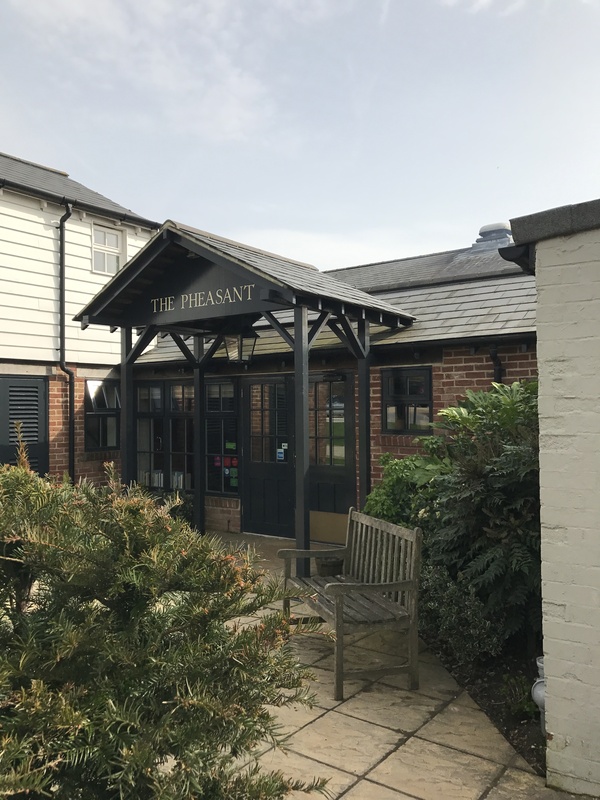 The Pheasant is five minutes from junction 14 of the M4 Motortway from London but sits on a country road overlooking fields and quaint English countryside for miles around. It is actually the first pub I went to when I arrived in the area – some friends took me there. It draws a lot of locals and the racing community from the villages around including Lambourne, famous for all the racing training stables. If you love horses then arrange to come to this area on Good Friday as Lambounre opens its doors to all the stables once a year on this day. It is a fantastic experience and the horses are beautiful and the stables enormous and pristine. You are likely to see the winning horse of the Cheltenham cup or other major races. It has a snug little alcove with leather sofa which is perfect for curling up with the Sunday newspapers or a book. I sometimes stop here before or after I’ve been to the Watermill theatre. It is unbelievably picturesque. The drive from the A34 past Winterbourne to the Watermill is just 10 minutes but one of my favourite drives in England along a twisting narrow road past lovely thatched houses partly obscured by weeping willows, grand sculpted trees and fields planted differently so as to be pleasing to the eye. The Winterbourne arms is a proper pub (not just gastro) with a wonderfully welcoming front entrance and a delicious menu (Venison steak , game bourguignon, Burger, fish and chips, trio of lamb and rosemary sausages with red wine sauce…) – highly recommended. As with the Red House below, I think there is another pub of similar name within five miles so make sure you go to the one in Winterbourne village just 5 minutes from Junction 13 on the M4 Motorway. This is in a lovely old thatched building and the name is a bit of a giveaway – inside the walls are my favourite shade of red – rich, warm and indulgent in winter. In Summer sit outside in their pretty garden. It is in a very pretty spot for walking and one of the options is a canal walk. A couple of times I’ve walked here along the canal from Hungerford, arriving feeling I’d earned lunch! Their fish and chips and Sunday roasts are always really good as are their patés. I will update this post with a picture next time I go there. A word of warning – I found to my cost that there are no fewer than three pubs of this name within a 20 mile radius so make sure you head for the one at Marsh Benham! This is probably the closest to Reading of my favourite pubs. I first heard of it when a friend used to teach cooking there. It is in the wonderfully in middle of nowhere but made it into England’s top 100 restaurants in 2017 (in one of the main newspapers). It is a cooking school, pub and restaurant. Make sure to book the restaurant a couple of days ahead. After a wonderful Sunday lunch, go for a good walk and wind up at the Royal Oak in nearby Yattendon for tea. I will add photos to this post next time I go there. One final favourite pub is just over the county border in Oxfordshire in East Hendred. It is the Eyston Arms. The village is delightful and the food is fabulous – last time I had a memorable Boef Bourignon with rich reduced wine based sauce and shared a sticky toffee pudding with a friend though if calories are no concern you’ll want one all to yourself! They have a patio with tables at the back for when the weather is nice. You definitely need to reserve a day or so before you want to go. Please like and follow my blog and also I’d really appreciate if if you would like my facebook page for this blog. Thank you so much! Too far from a concert hall? Travel to… your own home and turn it into one!